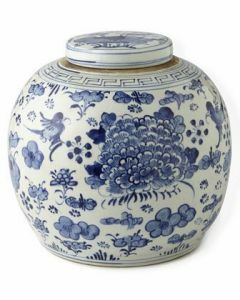 Ginger jars make a timeless decorating option for traditional and contemporary interiors alike. This one is handmade and features a lid with a lion handle. It measures 27.5” H. Click on image for greater detail. Please note this item is hand made; minor variation in color, shape, glaze etc. is expected and is not considered as manufacturing defect.